Do you have a hard time getting motivated to exercise on your own? Would you like to exercise with a small group of people your own age? Then we have the fitness class for you! 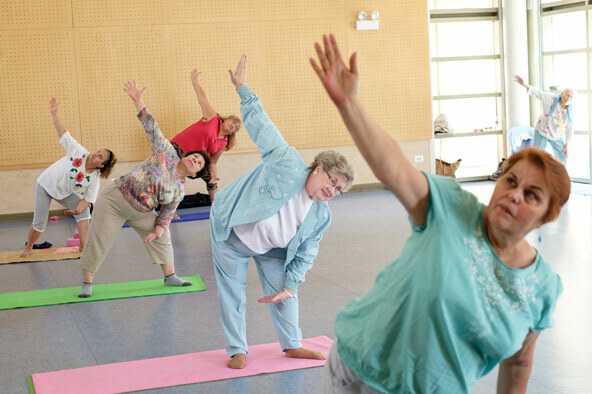 Our classes are a mixture of a gentle cardio workout combined with Yoga and Tai Chi exercises. Lead by a certified Yoga instructor, these calming movements help reduce stress, maintain flexibility, improve balance and promote healthy joints. There is also social time while enjoying nutritious snacks and lunches. Come early for snacks and stay later for lunch. All classes and lunches are at no cost; donations are greatly appreciated.